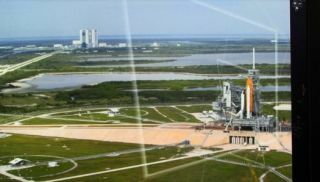 This still, taken from a Microsoft Live Labs video demonstration of its Photosynth software, shows NASA's space shuttle Endeavour at Pad 39A as it is primed for an Aug. 8, 2007 launch from Florida's Kennedy Space Center in Cape Canaveral, Florida. NASA andMicrosoft have joined forces to give computer users a three-dimensional look ofthe space shuttle Endeavour as it is primed for a planned Wednesday launch. Interactiveviews of Endeavour, its Pad 39A launch site in Florida and of the orbiter as itwas assembled for its planned Aug. 8 launch were stitched together from hundredsof NASA photographs using Photosynth, a new imaging software created byMicrosoft Live Labs. "Thiscollaboration with Microsoft gives the public a new way to explore andparticipate in America's space program," said William Gerstenmaier, NASA'sassociate administrator for space operations, in a statement. "We arelooking into ways of using this new technology to support future missions." Created bythe Redmond, Washington-based Microsoft and the University of Washington, the Photosynth software is designedto assemble between hundreds and thousands of digital images into athree-dimensional (3-D) scene of a subject. NASA's Photosynth image collectionswere created under a collaborative effort between the agency's Kennedy SpaceCenter spaceport in Cape Canaveral, Florida, Ames Research Center in MoffettField, California and Microsoft's Live Labs. "WithPhotosynth, we take pictures of an environment and knit them together into anexperience that people can move through like a 3-D video game," MicrosoftLive Labs architect Blaise Aguera y Arcas. "NASA provided us with someoutstanding images and the result is an experience that will wow anyone wantingto get a closer look at the Endeavour and its travels." In additionto views of Endeavour, NASA's Photosynth collection includes views of theAtlantis orbiter after its jumbo jet piggyback ride back to KSC following its June22 landing at Edwards Air Force Base in California, the space agency said. "We see potential touse Photosynth for a variety of future mission activities, from inspecting theInternational Space Station and the Hubble Space Telescope to viewing landingsites on the moon and Mars," said Chris Kemp, director of StrategicBusiness Development at Ames. NASA'sspace shuttle Endeavour is poised tolaunch towards the International Space Station at 6:36 p.m. EDT (2236GMT) on Aug. 8 to haul cargo, spare parts and a new piece of starboard-sidetruss to the orbital laboratory. Veteranshuttle flyer Scott Kelly is commanding Endeavour's seven-astronaut STS-118crew. The mission also marks the first flight of educator-turned-astronautBarbara Morgan. The former McCall, Idaho schoolteacher was originally selectedin 1985 to serve as NASA's backup Teacher in Space to New Hampshire high schoolteacher Christa McAuliffe, who died aboard the space shuttle Challenger inJanuary 1986. Endeavour'sup-to-14-day mission will mark NASA's second of up to four planned shuttleflights dedicated to space station construction this year. For more onMicrosoft Live Labs' NASA Photosynth collection, clickhere.